After our introduction of VIP to Neverwinter last year, it quickly became a popular purchase in the Zen Market. Now, we’re introducing an addition to the VIP category by bundling it up with the new and twisted Paranoid Delusion companion. For a limited time, get this bundle from the Zen Market before it disappears into your psyche. Paranoid Delusion – A being of no true identity, this manifestation defines itself according to its perception of its master, altering its appearance and combat behavior to reflect the master’s role. The Paranoid Delusion has initial points in Hit Points, Power, Critical Strike and Armor Penetration. Its Active Bonus increases your damage against rooted, disabled, held or prone targets. 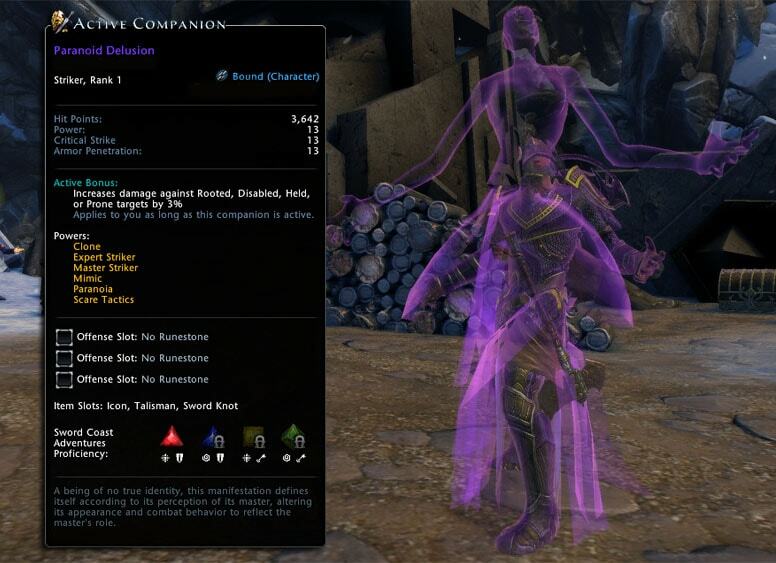 We’re looking forward to seeing double the hero with the new Paranoid Delusion companion!